Re: Does gold tarnish? -- Frederick II Post Reply Edit Forum Where am I? 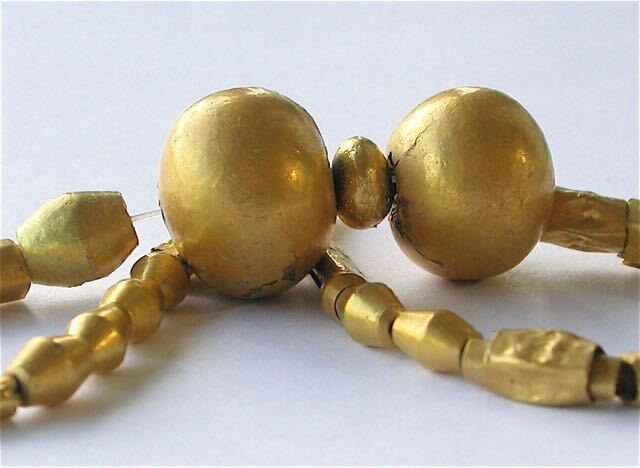 1. is a group of beads from an early Dvaravati (pronounced Tawarawati) site in Central Thailand. They date from the 4th-6th century. Some are solid gold, others are gold over a resin core. The gold content is high in all of them, from 75% to 90%, and again there is no tarnishing, though there's a very pretty orange patina in places that I ought to look at microscopically and haven't! 2. is a group of beads that seem to date from somewhat earlier (C1-3 perhaps) which were found in Central Thailand also. They seem to be absolutely unique, and I really have no basis to say whether they were made where they were found or somewhere else entirely. For the moment, my best guess is that they might have been made in Central-Northern India and imported, along with carnelian and agate, into Thailand, but that is only a guess. 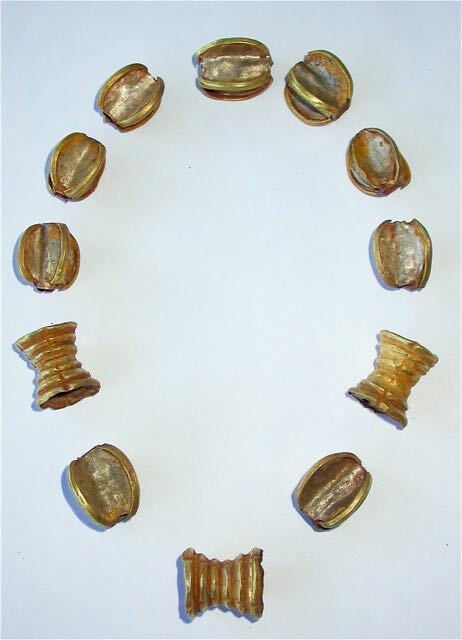 They were found together, but the gold content in the three drum-shaped beads is higher (though still quite low at around 40%) than in the "gold" (25-30%), struts of the nine mainly silver seed-shaped beads. The drum beads show only occasional tarnished patches, while the tarnishing is more generalized on the seed-shaped beads - I clean it off lightly from time to time so that one can see the contrast between the silver and the "gold". I think in all of this there's an interesting discussion about the social function of gold and the different kinds of value attached to it.